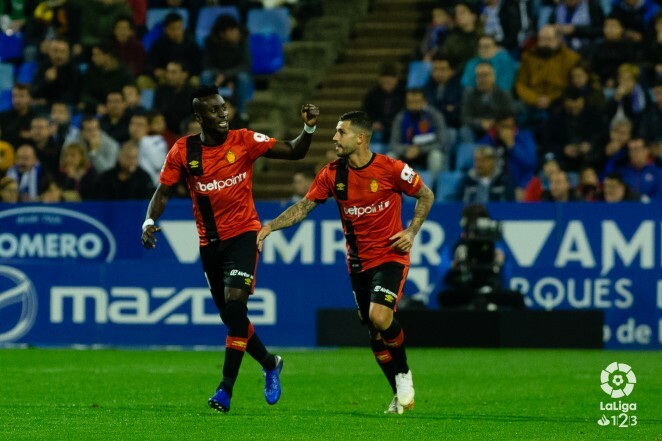 With one third of the season already gone after a meritorious 2-2 draw at Zaragoza last Sunday 18th November, Real Mallorca sit eighth in the Spanish second division. They are just one point away from a play-off position and after achieving promotion last season this is indeed excellent progress. A draw at Zaragoza would normally be perceived as a point gained but in reality the islanders returned home with the distinct feeling of dropping two points. Head coach Vicente Moreno was forced to reshuffle his defensive line up with keeper Manolo Reina, central defenders Antonio Raillo, Martin Valjent and fullback Salva Ruiz all absent with injuries. Franco Russo came in to central defence and the Argentinean performed admirably. The star of the show in the first half was Lago Junior who is in a rich goalscoring vein. He scored his first on six minutes and doubled his tally by the twentieth minute. More chances went begging but Moreno was a happy man at the break with Mallorca on track for a notable away win. Everything changed in the second half when midfield maestro Salva Sevilla was stretchered off after receiving the full force of the ball in his “nether regions”. His calming influence was sorely missed and the home side started to find a way back into contention. On 65 minutes a scuffed shot found its way into the Mallorca net. Aridai then had a chance to put the game to bed five minutes later when clear on goal but failed to hit the target. Aridai is something of an enigma for sure. The Canary Islander has scored some spectacular goals and committed some spectacular misses. Another fortuitous goal for Zaragoza levelled things up. They pressed for a winner but young Manacor-born goalkeeper Miguel Parera was in fine form. He has played the last 3 games and his form will give Moreno a selection dilemma now that Reina is fit again. The week before, Mallorca took Cordoba to the cleaners with an emphatic 3-0 home win. A lacklustre first half changed completely when Alex Lopez converted a brilliant cross from Lago Junior. Substitute Sergio Buenacasa then created a simple chance for Dani Rodriguez to score his first Mallorca goal. Lago rounded off the scoring with a brilliant third from a slide rule pass from Salva Sevilla. The fans left the Son Moix stadium in good heart with dreams of a play off beginning to take shape. Mallorca are at home to Numancia this Sunday 25th November with a 12-noon kick off followed by a trip to Reus the week after.